Take advantage of the tremendous energy savings of water to water heat recovery chillers in an outdoor design. Take advantage of the tremendous energy savings of water to water heat recovery chillers in an outdoor design. 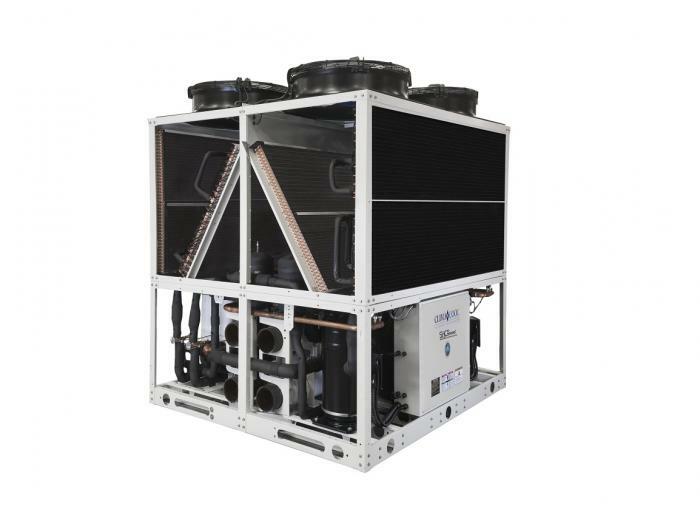 Each module contains individual brazed plate evaporator and brazed plate condenser for maximum chilled water and hot water output in heat recovery mode. Modules will optimize their output by operating in the water to water heat recovery mode. Integral air cooled fans will only operate when there is an unequal cooling or heating building load for the operating modules. Fans act so that heat can be added or taken out of the refrigerant loop eliminating the need for geothermal well fields or other source/sinks.